Authors: BEST, R. C.; MONTGOMERY, G. G.; YAMAKOSHI, M.
Authors: THATCHER, V. E.; VARELA, A. B. Authors: FALCÃO , M. de A. ; LLERAS, E. .; KERR, W. E.; CARREIRA, L. M. M.
Authors: GUERRA, R. T.; ASAKAVA, N.
Authors: SANTOS, A. dos; RIBEIRO, M. de N. G.; RIBEIRO, J. S. B.; BRINGEL, S. R. B. Authors: MARINHO, H. A.; FRANÇA, T. S.; REBELO, Y. S.; SHRIMPTON, R.
Title: The chemical composition of Amazonian plants. 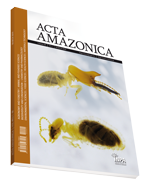 A catalogue edited by Setor de Fitoquímica do INPA, Manaus, Amazonas . Authors: ALENCAR, J. da C.; FERNANDES, N. P .; LOUREIRO, A. A. Authors: BUENO, C. R & WEIGEL, P.
Authors: RAFAEL, J. A.; CHARLWOOD, J. D.
Authors: SANTOS, J. M. M. dos; CONTEL, E. P. B.; KERR, W. E .